How many fingers on hand? Restoration of family steading. I need help. The section is devoted to our well-known namesakes and made on the basis of materials of various published sources. - (1760 (1762?) - 6 (18) .4.1816) - scientist - physician, doctor of philosophy (1786), doctor of medicine (1797). The native from Grodno or Schavel economy. He studied in the Grodno medical academy before its translation in 1781 in Vilno. Has ended Main school of Vilno (1786). With 1798 - the vice-professor, with 1800 - the professor of faculty of theoretical surgery and obstetrics of this higher school. In 1798-99 he raised qualification on obstetrics in Vienna. By reorganization of Main school of Vilno in university of Vilno in 1803, has created and has headed the first independent clinic of obstetrics. Since 1804 the censor of university, the free-of-charge doctor of a children's shelter. Has printed the works in magazine " Dziennik Wilenski ". 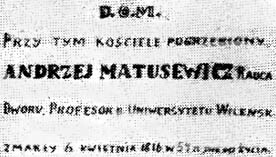 A.M.Matusevich's scientific labours are devoted to obstetrics and children's illnesses. Has died and is buried in Vilno. Andrey Mihajlovich Matusevich's name was immortalized with a memorial board in church of Santa Stefan. - (1765-1819) - political, the statesman of Rech Pospolita, the writer, the orator, minister of belongings of the Warsaw princedom and Kingdom Polish. He was elected the deputy Brest-Lithuanian region on Grodno assembly (1784), the deputy in the Tribunal of the Great Princedom Lithuanian (1786). Participated in development of the project of the Constitution May, 3 (1791). Communicated (1803-1805) with the assistant, and with 1804 - acting as Minister for Foreign Affairs of Russia Adam Chartoryski. One of organizers and the first members of Association of friends of Sciences in Warsaw (the beginning XIX in.). - (01.01.1852 - 23.01.1912) - admiral of 1-st squadron of the Pacific of a marine fleet of Russian empire. In 1870 has arrived in fleet as a cadet and he served on the Black sea up to 1900. He commanded of steamship "Colchis" (1893-1894), of floating dock of the Sevastopol port (1894-1895), of gunboat "Uralec" (1895-1897), of steamship "Eriklik" (1897-1898). In 1900 he's translated to Pacific ocean. He commanded of the cruiser of 1-st rank "Admiral Kornilov" (1900), of of 1-st rank "Ryurik" (1900-1903). He managed group of torpedo boats (23.10.1903-01.1904), of 1-st group of torpedo boats of a squadron of Pacific ocean (01.1904-02.1904). 27.02.1904 On counter-torpedo boat "Imperous" in fight with Japanese at Port Arthur was wounded and contused. 29.03.1904 he was appointed rear admiral. 28.07.1904 in fight with the Japanese fleet in the Yellow sea he was wounded, contused and poisoned with gases on a flagman battleship "Cesarevitch". Ad interim appointee as the commander of the Practical squadron of the Black Sea Fleet (1905). Younger flag-officer of the Baltic Fleet (1907). The commander of the Vladivostok port, the chief of naval Forces in Pacific ocean (1908). 29.03.1909 29.03.1909 he has received a rank of vice-admiral. Has died in Sevastopol. - (29.3 (10.4) .1879, Nikolaev, - 27.5.1950, Leningrad) - - the Soviet hydrographer - geodesist, engineer - vice-admiral, deserved worker of science and technic of RSFSR (1944). Has ended Sea academy (1904) and the Petersburg university (1909). With 1931 - professor of the naval Academy. In 1911-31 has supervised over hydrographic works on White, Barentchevo and Karskoe seas. The name of Nikolay Nikolaevich Matusevich has named bay of islands of October Revolution (Northern Earth) and the river running into it. Has rewarded with order of Lenin, other orders, and also medals. - (1884, village Laparovichi of the Minsk district - February 1943) - one of organizers and heads of the Minsk patriotic underground of times of Great domestic war. In 1941, I.I.Matusevich worked as the employee on a railway junction of Minsk, participated in evacuation of the population and the industrial equipment in rear. In the beginning of occupation of Minsk, has created together with F.Kuznetsov the underground group at a van-repair factory. Since May 1942 member, and since September - the secretary of Railway underground RK KP(b)B of Minsk. October, 2, 1942 was arrested. Was lost in fascist torture chambers. In capital of Belarus - Minsk - name of Ivan Matusevich names street. - (1886, Minsk - 28.07.1939, New York) - the well-known musician, established, along with his sons Boris and Sergei, tradition of game on the classical concertina and accordion in USA. G.Matusevich was born in big family in Minsk. His father Hyman was the owner of large house-furnishing shop. In the childhood Gregory, with the help of private teacher, has received skills of game on a violin. Once, at teenage age, he has casually heard, as a certain drunk Tartar played on concertina. Grigory was fascinated by a melodious sounds of this musical tool and has immediately bought it for a bottle of vodka.Subsequently he, without someone's lessons, has reached masterly possession of concertina. G.Matusevich has made outstanding musical career in Russian empire, the Western Europe and is especial in United States. In 1920 he has moved the family to Danzig, Germany (now Gdansk, Poland). There he has received passport of a League of Nations, which gave him the right to travel to other countries. He much acted with concerts in Germany, Czechoslovakia, USA. The typical concert program consist of the works written for a violin, but sounded concertina - master- piece of Tchaikovsky, Sarasate, Mozart and Kreisler. 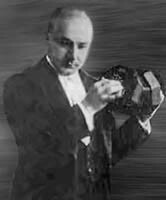 In United States Grigory debuted in February, 1922 in New York. Criticism accepted him with delight. In 1924 the United States granted the entire Matusewitch family an immigration visa and they settled in the borough of the Bronx in New York City. In the U.S. Gregory was incredibly popular, he continuously acted, intensively worked even during Depression years. Sons G.Matusevicha - Boris and Sergey - also known musicians in USA: Sergey many years was a sample of game on a classical accordion; Boris, as well as father, masterly played on concertina. For this reason, surname "Matusewitch" in United States is synonymous with the name of this musical tool. (Thomas Gabriel, "The Russian Virtuosi in America: An Interview with Sergei Matusewitch, "Concertina & Squeezebox, Issue No. 21, 1989, p. 4.). - (4.10.1907, Minsk - ?) - byelorussian Soviet actor. The national actor of the USSR (1972). Has ended studio of the Byelorussian drama theatre of a name of J.Kolas (1928), in which long time worked. As it is written in the Byelorussian Soviet Encyclopedia (1982), Joseph A. Matusevich - the picturesque comedy actor. Sharp plastic figure of a role, the vital truth and brightness of scenic paints is inherent in his art. Joseph Matusevich's talent was especially showed in the Byelorussian national repertoir: Kutorga (V. Dunin-Martinkevich's "Pinskaya shlyahta"), uncle Esip ("Naval'nitsa budze" by Y. Kolas's trilogy "Na rostanyah"), Symon Rapetko (K. Chernyj's "Bats'kaushchyna"), Voit (P. Danilov's "Lyavoniha"), Sudiya (V. Volskij's "Nescerka"), Dimar (I. Shamyakin's "Sertsa na daloni"), Goroshko (A. Makaenak's "Vybachaitse, kali laska"), pop Iliya (U. Korotkevich's "Zvany Vitsebska") etc. - ( 14 (17) .21.1900, village Chernevichi of Borisov district - 30.9.1975) - scientist - economist. The candidate of historical sciences (1936). Has ended the Byelorussian state university (1930). Since 1932 worked in Institute of economy of Academy of sciences of BSSR. In 1934 - 38 the deputy director of a department of professional training of AS of BSSR, the scientific secretary of Institute of economy. In 1938 -1954 was subjected to repression 1954. In 1955 was rehabilitated. In 1955-71 the manager of sector of Institute of economy. The basic scientific works of M.G.Matusevich's are devoted to research of problems of development of the industry and also an economic history of Belarus. - (1948, Minsk - 09.1998, Minsk) - manager of deanery of Byelorussian Greek-Catholic Church, protopresviter. Has studied in the Byelorussian State theatrical-art institute on producer's branch, worked in cultural - educational establishments of Minsk. Has ended the Moscow theological seminary in Zagorsk (Sergiev Pasad). In 1979 has passed examinations of outsider for a rate of Catholic seminary in Poland. From end 1979 till April 1990 - chaplain of Catholic parish in village Baruny of district of Oshmyany of Grodno area. 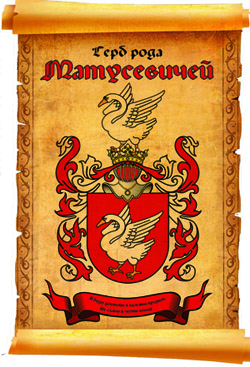 In 1991 was accepted under jurisdiction of Ukrainian Greek-Catholic biscupe in Ivano-Frankovsk. 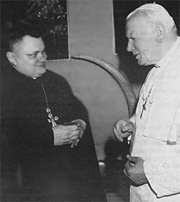 In beginning 1993 was appointed dean of the Byelorussian Greek-Catholic Church. In January 1994 Congregation of east Churches officially confirmed his rights as manager of deanery of Byelorussian Greek-Catholic Church, and also chaplain of parish of Saint Jazep in Minsk. - (16.11.1937, Minsk) - byelorussian Soviet sportsman (skating sports). The master of sports of the USSR of the international class (1965). The bronze prize-winner of the world championship (1965, Oslo) on distances 1500, 5000 m. The absolute champion of Europe (1965, Geteborg, Sweden), silver (1968, Oslo) and bronze (1968, Lahti, Finland) the prize-winner in multiathlon. The champion of Europe on a distance of 1500 m (1965, 1968), the silver prize-winner on distances of 500 m (1967, 1968), 5000 m 1965, the bronze prize-winner on a distance of 2500 m (1967), the absolute champion of the USSR (1964-1966,1968), the champion of the USSR on a distance 1500м (1964, 1966), 5000 m (1965), the champion of a winter Games of peoples of the USSR (1966) in multiathlon and on a distance in 1500м. The winner and the prize-winner of the international and all-Union competitions, the champion of the world on flat skating rinks on a distance 1500 ( 1968 ), the champion of the USSR in multiathlon and on separate distances.